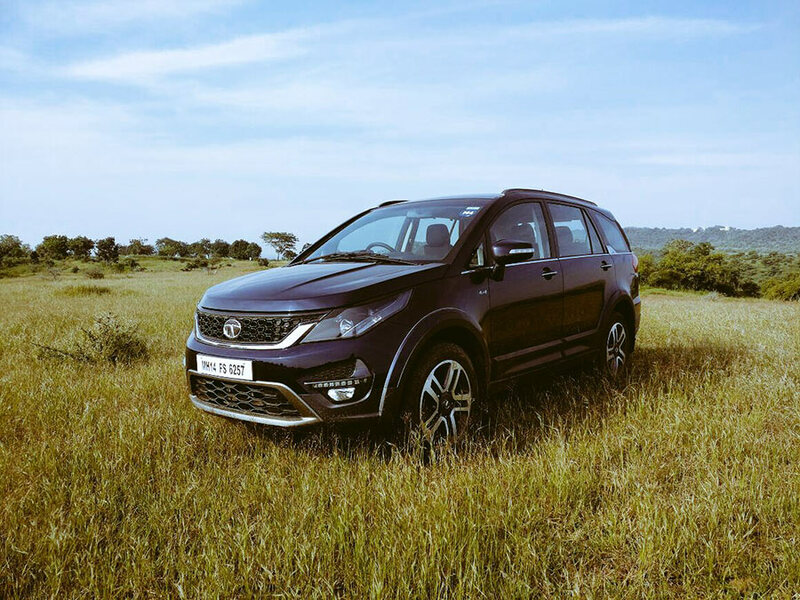 Tata’s brand new lifestyle utility vehicle packs a punch both on the engineering and the looks department. It is also offered in a host of variants. We get our hands on the highest end 4 x 4 manual version and take it for a spin. What's the first thing that comes to mind when someone mentions the name, Tata? Apart from the fact that it is a company that purchased Jaguar Land Rover, Tata and big vehicles go hand in hand, these include everything from massive trucks to SUVs like the DICOR and everyone’s favourite the Sumo. However, off late, the company has been striving hard to change its image to a more premium one and leaving no stone unturned to achieve it. Things took off with the Bolt and then the Tiago broke covers and stole our heart with its looks features and overall value for money. Just when you thought it was a lull period, Tata decided to up its game, this time by a huge notch. With the Hexa! The driver dropped the car to my home at about 4 in the evening and I was excited to give it a spin once I got back from work. Once you set your eyes on it, you will know that Tata has pulled off a winner as far as looks go. The car sports clean lines and yet looks aggressive from every angle. The clamshell bonnet, stretched back headlamps land the aggression exactly where it is required. With the wrap-around black cladding taking the beefcake looks a notch higher. Every single place I stopped, I was asked about the car, its pricing and people were truly interested in the styling of the car. It looks stylish from all angles and I am truly thrilled Tata has put in a lot of effort in this department. Step inside and it feels premium. If you are anywhere above 5.10 feet you won’t have any issue getting inside, however, if you are shorter, climbing in will be an exercise. The seats are comfortable for long journeys and there is a nice bit of work gone into them. One of the things I sorely missed in this car was a sunroof, which would have sealed the deal for me as far as the interiors go. Glance your eyes on the dashboard and there are bits that are good and some that aren’t. The steering wheel has a nice chunky feel to it but the switchgear quality might not be the best in class but you won’t hate it. The all-wheel-drive Hexa sports a rotary controller for selecting one of the four drive modes. It is located at the base of the centre console and lets you choose between Comfort, Dynamic, Rough and Auto. Tata has paid a lot of attention to both, comfort and safety. While six airbags ensure that you will walk out unscathed in the unfortunate event of a crash. The large screen on the centre console has a decent viewing angle but when it comes to touch sensitivity it feels hugely lacking. The touch response when using various functions is simply not up to mark with what the competition has to offer. Start driving and you will feel its bulk when driving in the city. The good bit is that, due to that commanding driving position you will feel supreme while driving and that adds to the wow factor. U-turn manoeuvres will need some time to getting used though the rear camera helps immensely when trying to park in a tight spot. The heavy clutch and the plasticky gearshift does not help things. However once you get past that and the 1500rpm mark, the new 2.2L Varicor 400 engine shows its true colours both in the city and even more so out on the highway. The 4 x 4 version we received for a review does brilliantly well with off-roading. The inclusion of Hill descent control helps things along nicely and the car gives you enough confidence to try tricky terrain. The 19 wheels and suspension which now retuned, make a mockery of potholes and pretty much and road conditions within the city. The chassis which is now even more rigid works nicely with the stiffer suspension as you cruise along at triple-digit speeds on the national highway. At over 2.2 tons the Hexa will make its presence felt if you indulge it in a high speed trickery but it stays composed for the maximum part. The 2.2 Liter Varicor 400 engine won’t push you back into your seats as you plant the throttle but it feels adequate once you cross the 1500rpm mark and the good bit is that noise has been well insulated too. Changing the driving mode from Comfort to Dynamic does make the drive peppier with minimal ESP handholding. While driving through ghats, power never feels lacking. However, the automatic version will come in handy here.